PASADENA, Calif. -- The longest-serving of six spacecraft now studying Mars is up to new tricks for a third two-year extension of its mission to examine the most Earthlike of known foreign planets. 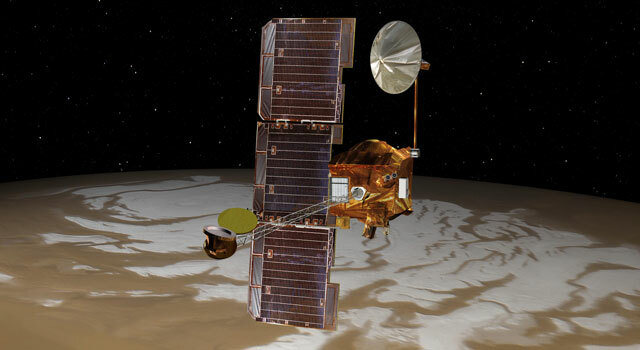 NASA's Mars Odyssey is altering its orbit to gain even better sensitivity for its infrared mapping of Martian minerals. During the mission extension through September 2010, it will also point its camera with more flexibility than it has ever used before. Odyssey reached Mars in 2001. The orbit adjustment will allow Odyssey's Thermal Emission Imaging System to look down at sites when it's mid-afternoon, rather than late afternoon. The multipurpose camera will take advantage of the infrared radiation emitted by the warmer rocks to provide clues to the rocks' identities. "This will allow us to do much more sensitive detection and mapping of minerals," said Odyssey Project Scientist Jeffrey Plaut of NASA's Jet Propulsion Laboratory, Pasadena, Calif. The mission's orbit design before now used a compromise between what works best for the Thermal Emission Imaging System and what works best for another instrument, the Gamma Ray Spectrometer. On commands from its operations team at JPL and at Denver-based Lockheed Martin Space Systems, Odyssey fired thrusters for nearly 6 minutes on Sept. 30, the final day of the mission's second two-year extension. "This was our biggest maneuver since 2002, and it went well," said JPL's Gaylon McSmith, Odyssey mission manager. "The spacecraft is in good health. The propellant supply is adequate for operating through at least 2015." The push imparted by the Sept. 30 maneuver will gradually change that synchronization over the next year or so. Its effect is that the time of day on the ground when Odyssey is overhead is now getting earlier by about 20 seconds per day. A follow-up maneuver, probably in late 2009 when the overpass time is between 2:30 and 3:00 p.m., will end the progression toward earlier times. While aiding performance of the Thermal Emission Imaging System, the shift to mid-afternoon is expected to stop the use of one of three instruments in Odyssey's Gamma Ray Spectrometer suite. The suite's gamma ray detector needs a later-hour orbit to avoid overheating of a critical component. The suite's neutron spectrometer and high-energy neutron detector are expected to keep operating. The Gamma Ray Spectrometer provided dramatic discoveries of water-ice near the surface throughout much of high-latitude Mars, the impetus for NASA's Phoenix Mars Lander mission. The gamma ray detector has also mapped global distribution of many elements, such as iron, silicon and potassium, a high science priority for the first and second extensions of the Odyssey mission. A panel of planetary scientists assembled by NASA recommended this year that Odyssey make the orbit adjustment to get the best science return from the mission in coming years. Increased sensitivity for identifying surface minerals is a key science goal for the mission extension beginning this month. Also, the Odyssey team plans to begin occasionally aiming the camera away from the straight-down pointing that has been used throughout the mission. This will allow the team to fill in some gaps in earlier mapping and also create some stereo, three-dimensional imaging. Odyssey will continue providing crucial support for Mars surface missions as well as conducting its own investigations. It has relayed to Earth nearly all data returned from NASA rovers Spirit and Opportunity. It shares with NASA's Mars Reconnaissance Orbiter the relay role for Phoenix. It has made targeted observations for evaluating candidate landing sites. Mars Odyssey, launched in 2001, is managed by JPL, a division of the California Institute of Technology, Pasadena, for NASA's Science Mission Directorate, Washington. Lockheed Martin Space Systems, Denver, is the prime contractor for the project and built the spacecraft. Investigators at Arizona State University, Tempe, operate the Thermal Emission Imaging System. Investigators at the University of Arizona, Tucson, head operation of the Gamma Ray Spectrometer. Additional science partners are located at the Russian Aviation and Space Agency, which provided the high-energy neutron detector, and at Los Alamos National Laboratories, New Mexico, which provided the neutron spectrometer.